I came across a few interesting news articles from 2015 that, while a bit far afield from the story of Josef Jakobs, are intriguing nonetheless (see links below). The stories centre on some Dutch farmers in Norfolk who were apparently building secret airfields and hangers for Germany's invasion of England. For 4 years, commencing in 1936, Dutch farmers of the East Anglian Real Property Company had been building huge barns and apparently preparing fields to serve as air strips for the German invasion. The RAF, on the hunt for new air strips in 1940 saw that all the likely looking sites were already occupied by suspicious barns with red roofs, chicken coops in the shape of swastikas and fields devoid of crops. The Dutch farmers were all rounded up, arrested and interrogated. While some newspaper articles call them "spies", this seems highly unlikely as all were later released. Although... some news articles note that some managers were kept in jail while "their children were found billets in local houses and later deported." The 2015 articles all refer to English Heritage military expert, Roger Thomas, from the York area who came across an Air Ministry file at the National Archives by accident. None of news articles give the folio reference for the file, which makes it extremely difficult to corroborate the information. One would think that such a story might be published in a reputable journal with relevant references so other researchers can confirm and contribute to the story. So far... no luck. Roger Thomas does work for English Heritage and seems to have a broad interest in military history, and architecture. I am going to hazard a guess that this was one of those "pre-invasion jitters" stories that were so common in 1940. English folk saw evidence of Nazi spies everywhere... in strange markings on telephone poles, in lights flashing from houses, in German paratroopers dressed as nuns and obviously... in strangely shaped foreign-looking barns and weird farming practices by Dutch farmers. One news article went so far as to suggest that Hitler may have had a bizarre plot to capture King George VI, given how close these suspicious farms were to Sandringham, one of the royal estates. Wild speculation I would suggest. The Easter Daily Press article does have a few tantalizing details from the Air Ministry files but... sadly... no actual references for the files. A writer by the name of Steve Snelling has suggested that the stories were all part of the invasion scare and, given that the Dutch farmers were all released, suggests there was no truth to the stories. 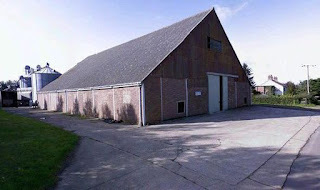 An article on the Geograph website has a list of the remaining Dutch barns that are in existence and a short write-up of the furor generated by Roger Thomas. The author of the article, Evelyn Simak, notes: "A record of these events is apparently kept at the National Archives but confirmation of the buildings having been constructed in order to serve a purpose other than farming has so far eluded historians other than Roger Thomas." I think that says it all. Until such time as the actual reference number for the mysterious Air Ministry file is revealed, the story is pure speculation. York Press - Did Hitler Hatch Bizarre Plot to Capture King George VI? Eastern Daily Press - Was Norfolk at Centre of Hitler's pre-war invasion plans? 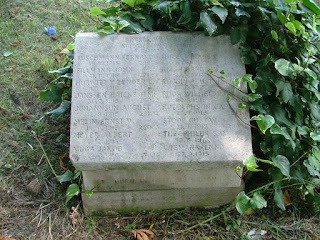 A number of spies were executed in England during World War I, most of them were shot at the Tower of London, and one, Robert Rosenthal was hanged at Wandsworth Prison in July 1915. Carl Hans Lody was the first spy to be caught and executed. He was buried in the East London Cemetery in 1914. For decades, his grave was unmarked. In the early 1970s, his descendants placed a marker on his grave (see cover of After the Battle magazine - Volume 11 - at right). "Only the grave of Karl Lody can be seen today--the other bodies, buried by the State in common graves, have since had other remains buried above them, the ground having been used several times. When the Volksbund Deutsche Kriegsgraberfursorge, the German War Graves Commission, were planning their cemetery at Cannock Chase (opened in 1967), they asked if it would be possible to disinter the bodies. Authorities at the cemetery pointed out that under British Law permission would have to be obtained from relatives of those buried above, before the graves could be opened--an almost impossible task where common burials are concerned. It seems the German authorities were satisfied with these arguments and the bodies remain interred at Plaistow. Near Karl Lody's grave is a memorial stone to the other ten Germans executed in the Tower. 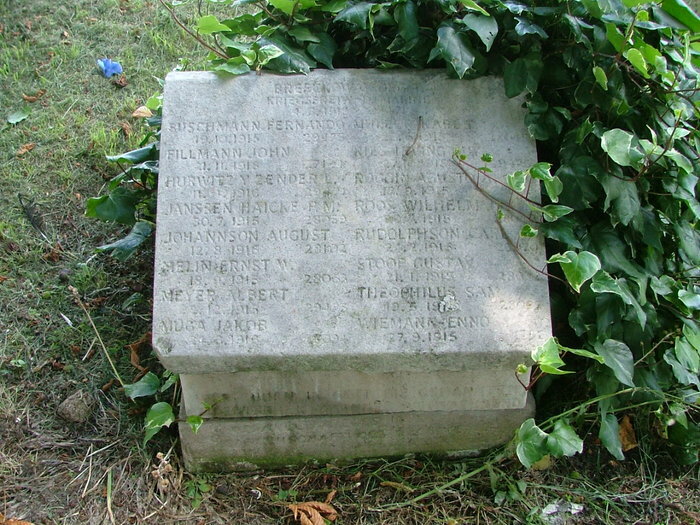 The stone also records the names of seven other Germans who died in British prisons during 1915/16." The war ended almost a century ago and little remains to tell the tale of these men who paid the ultimate price for their foolhardy bravery. What motivated these men, few of whom were German citizens, to spy for the Germans? Was it money? Was it coercion? A steep price to pay for very little reward and huge risk. The stories of these spies is told best in the book by Leonard Sellers - Shot in the Tower - published in 1997. Sellers does not tell the tale of Robert Rosenthal, the only "German" spy to be hanged during World War I. There's been a flurry of activity around Jan Willem Ter Braak the last couple of weeks. The media has learned that a gravestone is going to be placed on his grave and there have been a couple of articles that have come out. The Cambridge News and the Daily Mail have similar articles that both mention my website and blog (even quote it!)... although both call it a Dutch website... which it most certainly is not. I did contact the author of the Daily Mail article regarding the error... but we'll see what comes of that. The Mirror has an article on Ter Braak as well - but no mention of Josef Jakobs or this website/blog. On another note, I was contacted by ITV Anglia via Skype and answered a few questions about Ter Braak. It would seem that there is more interest in the stories of the wartime spies. 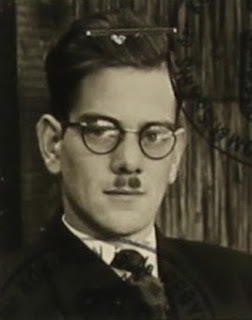 I'm also becoming aware that while I have a fair degree of knowledge about German espionage against Britain during the war... and think that much of this is common knowledge... most of it is not! Update - ITV Angia piece available at this link.